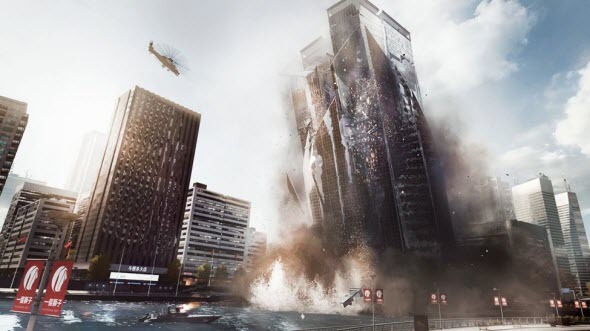 During the weekend DICE published new Battlefield 4 trailer that is supposed to be a TV spot. This video shows the fantastic Levolution system that allows players to destroy everything they meet on their way. Also the trailer includes the responses from real gamers, who have already played Battlefield 4. Actually, new Battlefield 4 trailer is not really new, because it consists of the previous "Only in Battlefield" videos. We would like to remind you that this series of trailers includes the enthusiastic reviews from various players and the short in-game footages. This time DICE has decided to bring all the best gameplay elements and the most satisfied gamers together and has released this 1-minute long Battlefield 4 trailer, which really impresses. The main thing, that is shown in the video, is Levolution system. This mechanics allows you to destroy and change the environment around you - everything starting from the walls and up to the huge skyscrapers. If you want to see how this system works, watch new Battlefield 4 trailer and don't forget to tell us about your impressions in the comments below.